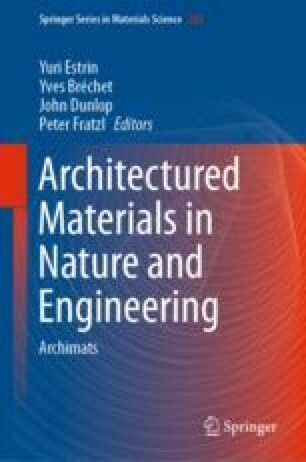 In this chapter, a group of processing techniques leading to desired materials architectures is discussed. They are based on severe plastic deformation (SPD) by shear combined with high hydrostatic pressure. Originally, these techniques were developed for imparting to the material an ultrafine grained (UFG) microstructure thus improving its mechanical performance characteristics. An added benefit of SPD processing in the context of architectured materials is its ability to tune the inner makeup of a hybrid material at a macroscopic scale. After a brief introduction to the available SPD processing techniques, we provide an analysis of architectured multiscale structures with UFG constituents they can produce. A target of this research is development of materials with a high specific strength and low overload sensitivity. Specific designs enabling a favourable combination of these properties are considered. An emphasis is put on structures that include soft layers whose presence delays strain localisation and failure of the hybrid material. YB would like to express his gratitude to the State Fund for Fundamental Research of the Ukraine for financial support through grant F71/56-2016. RK acknowledges funding support from the German Research Foundation (DFG) through Grant #IV98/8-1.